In this unconventional sitcom, grumpy comic Larry David plays a fictionalized version of himself. Aside from being a wealthy celebrity, Larry leads an unspectacular that would be really boring if not for his outspokenly antisocial nature. The series is notable for being largely improvised and for being only sporadically produced by the ambivalent David. In the Season 9 finale, Larry has a scheduling conflict; takes issue with work associates; and hosts a pair of ungrateful houseguests. [HBO] HD. 'The Shucker.' (Season Nine) Larry is blackmailed by an employee and tormented by someone from his past. [HBO] HD. 'Never Wait for Seconds!' (Season Nine) Bridget asks Larry for a favor on behalf of her son. Larry irks a hot yoga teacher; has an auspicious first date; and seethes over an encounter with an unfair ride-sharing driver. [HBO] HD. 'The Accidental Text on Purpose.' (Season Nine) Larry invents an ingenious ploy for getting his friends out of relationship jams. Larry commits a faux pas with Sammi's fiance, and tries to start over with his mail carrier and golf club security guard. Larry turns to a writer for advice. Searching for Susie’s missing “little sister,” he gets ticketed by an overzealous cop. Larry reaches out to a familiar face, and gives a hotel guest sartorial advice. Larry clashes with his New York neighbor Michael J. Fox; Jeff sacrifices for Susie; and Larry is flagged for giving an inappropriate birthday gift. Larry's relationship with his girlfriend (Ana Gasteyer), an important softball game and his therapy bills are all affected by his haunting traumatic childhood experience involving an ice-cream truck. Larry's training routine is put on hold while he and Jeff check out a new investment opportunity. Larry and Rosie O'Donnell vie for the affection of the same woman. Larry becomes the local hero and Jeff tries to become Ricky Gervais' friend. Larry is desperate to avoid a charity appearance. Meanwhile, Susie wants a lavish last meal for the Greene's ill dog. Larry has an interesting experience with his neighbor and later attempts to break a dating rule. Larry becomes a "social assassin" at a restaurant, on the golf course, and at a dinner party. Larry ironically becomes a role model for battered women; Richard Lewis's relationship with a burlesque performer is put to the test; Leon makes it through a case of mistaken identity. Larry deems his divorce attorney unsatisfactory and orders Girl Scout cookies from a sports franchise owner's daughter. Larry David's style appeals to Donald Trump's former chief advisor, for some reason. The new season of Larry David's comedy uses an old news story to stir up modern-day controversy. A new, long-awaited season of Larry David's HBO series finally has a premiere date. If you found it hard to believe that Larry David was really going to break his HBO series out of mothballs, there's some evidence this week that it's actually going to happen. Curb's ninth season went into production, and from that, there's (probably) no going back. Cheryl Hines Marries Robert Kennedy Jr.
"Curb Your Enthusiasm" actress Cheryl Hines has married the nephew of assassinated President John F. Kennedy, Robert Kennedy Jr., at the Kennedy compound in Cape Cod. Larry David spoke to journalists at the Television Critics Association's press tour in order to promote his new HBO movie, "Clear History." The journalists, though, were also wondering about the status of his beloved series, "Curb Your Enthusiasm." After a fierce bidding war, Michael J. Fox's new sitcom has landed at NBC. What does this mean for the sitcom, and for the network? Probably quite a bit. 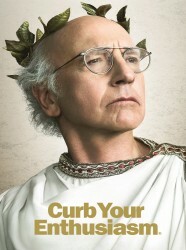 Curb Your Enthusiasm is currently available to watch and stream on HBO. You can also buy, rent Curb Your Enthusiasm on demand at Amazon Prime, Amazon, Hulu, HBO GO, HBO NOW, Vudu, FandangoNow, Google Play, iTunes online.